Two ELB Attempted Kidnappings (Mar. 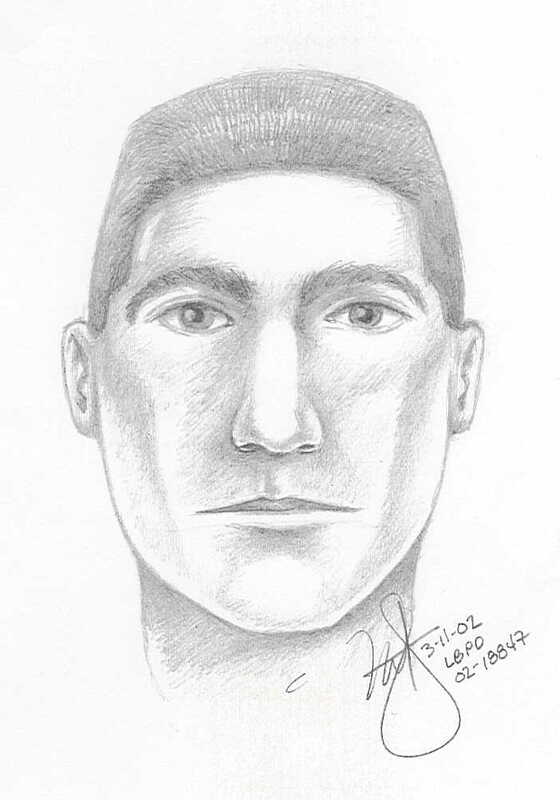 6 & 10) Of Female Teens Near Lakewood Blvd & Willow St.
(March 13, 2002) -- LBPD is asking for the public's help in locating the man in the sketch to the right. Police say he is a suspect in the attempted kidnappings of two teenage girls (age 13 and 17) in two separate incidents within the past four days in the area of Lakewood Blvd. and Willow St.
LBPD says that on March 6, 2002 in the early evening, a 13-year-old female LB resident was riding her bicycle in the area of Lakewood/Willow when a male attacker grabbed her from behind and pulled her from her bicycle toward a white van parked near by. The female victim resisted her attacker, escaped and ran from the area. Four days later, on March 10, 2002, again in the early evening, a 17-year-old female LB resident was jogging in the area of Lakewood/Willow when a male attacker grabbed her from behind and pulled her toward a white van parked near by. The female victim resisted, escaped and ran from the area. Police say, "Investigators believe these two incidents might be related. The suspect is described as a light complected 20-25 year-old male Hispanic, 5-06 to 5-09, short dark hair, brown eyes, medium build, clean shaven, and he was wearing a tan T-shirt and brown pants." LBPD asks anyone with information regarding these incidents is asked to contact Long Beach Homicide Detectives Richard Conant and Robert Erickson at (562) 570-7244.